Infinite series: When the sum of all positive integers is a small negative fraction. Important update, Jan. 17 at 18:00 UTC: There have been a lot of objections raised about the video mentioned below and the way I describe the math therein. It’s more than I can simply add or update here, so I’m going over all the input and will write a follow-up soon. Very briefly: The series manipulation done in the video is a bit of a trick and is not rigorous, but there are rigorous mathematical solutions which do work under certain circumstances. However, interpreting them is tricky. Again, more coming soon. Important update, Jan. 19 at 2:00 UTC: After writing this post, I received a lot of objections about it. The critical one is that the mathematical method used in the video to solve the series does not actually work, since it violates some rules about what sorts of things you can do with series. You can read what I wrote below, but note what I wrote about the videos is incorrect. However, I wrote a follow-up post that should clear this all up, so please read that after reading the article below. This post involves math. Really bizarre, brain-melting math. The math itself is actually not that complicated—I promise!—but the result will carve out a piece of your soul and leave hollow space. Seriously, please, bear with this. I pounded my head on my desk enough to leave a dent in the wood and a welt in my forehead to figure this out, so please just stick with it. When it’s done, you’ll have a better appreciation for just how completely flippin’ weird our Universe is. Math can be a bit tricky sometimes. OK, stop your uproarious laughter. I know, most normal people cringe in fear when math pops up in their lives. Of course it can be a bit tricky. But I’m not talking about word problems, or algebra, or trying to figure out compound interest (or balancing a checkbook, my own personal unscalable mountain). I mean math itself. You can sit down and write out a few simple things and wind up with an answer so bizarre, so counterintuitive, that you figure it must be wrong. But sometimes it isn’t. And infinite series are a great place to find things like that. I want you to watch a short video that shows you an example of this. It’s not too bad, and mostly involves just some simple addition and really basic algebra (really just substitution and such). I know, I know, but I never promised no homework when reading my blog. Right. How’s your brain? Still there? First, the credits: This was done by video-maker Brady Haran. He has a whole series of videos called Numberphile, where he discusses fun little math puzzles. Some of them are silly little things, and others have insights into math with truly cosmological consequences. Like the one you just saw. Let me say here, when I first saw it I thought it was an actual hoax, a joke (like being able to prove 1=2, an algebra trick most science/math dorks have seen). But it turns out that the conclusions they draw in that video are literally correct. 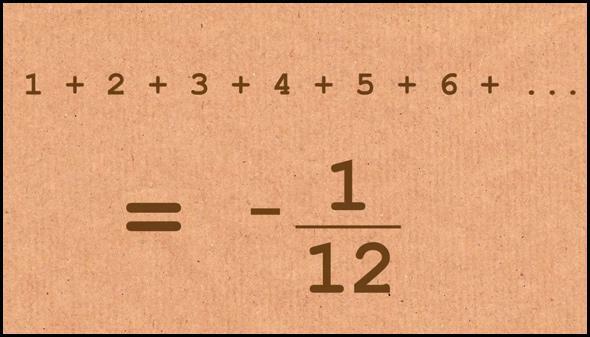 You can add an infinite series of positive numbers, and they’ll add up to a negative fraction. I can explain this, sort of, differently than they did in the video (I find in math that a second, different explanation can sometimes help). Let me be clear here: I am not a mathematician, though I did take some advanced math in college and grad school. This particular field was not something I was strongly versed in, so I relied on some friends who helped me here (including my old pal and solar astrophysicist Craig DeForest, who is quite seriously one of the smartest folks I know, and it was on his Facebook page where I first saw the video). If there are any errors here, they’re mine and mine alone. And honestly, a small part of my brain still thinks he’s punking me. First, what’s an infinite series? No, not Doctor Who. The mathy kind of infinite series. You may have covered series in high school. A finite series is where you have a long series of numbers (each one is called a “term”) that you add together, or subtract, or both. If you take all the terms and do the math, you get a number (called the sum). For example, 1+2+3+4+5=15. You can carry that out to a million terms, and you’ll get a much larger number. In this case, you don’t stop at the 5. The “…” means you keep doing it forever. Literally, forever. There is no final term, it just keeps going and going. Series like these have many uses in math and even in the real world, if you call physics the real world (and I do, because it is). Many times, a series like this will converge to a single number. That means that if you add all the terms up out to infinity, you get a simple number. That usually happens when each term gets smaller than the one before it, so you’re adding teenier and teenier numbers together. One way to think of it is that at infinity, the numbers are so small they’re essentially 0, and it’s done. That’s not a great way to think of it, because it’s not really true—you can’t count to infinity—but the imagery helps a bit. You’d think, because it’s adding together positive numbers and because they keep getting bigger, if you take this out to infinity then it would never converge. It never stops. It just keeps getting bigger. Infinitely big. However, as you saw in the video, that’s not really true. In point of fact, this series does have a consistent answer (even if the series itself does not strictly converge). And that number really is -1/12. Seriously. I know it seems ridiculous, but that’s because we live our lives in a finite world. Once you introduce actual infinity, some real-world conclusions go out the window. I have to explain this using analogies, which are necessarily incomplete, but will hopefully make this easier to understand. This is called Grandi’s series. Once they get this, everything else afterward is pretty straightforward algebra. So we need to unlock the secrets of this weird series (Numberphile has a video on this as well). So how can you alternately add and subtract 1’s forever, add them up, and get ½? That doesn’t make sense at first blush. For example, if you stop the series somewhere and add all the terms, you get either 0 or 1. It just flips back and forth between them. It never equals ½, and certainly shouldn’t add up to it. So how can it? Let’s think of it a different way. Imagine there’s a staircase in front of you, and you spend one minute at the bottom of the steps. Then you climb to the first step and stay there for one minute. On average, you stayed for two minutes at the 1/2th step! Reduce the scale, and the Grandi series starts to look less like a zigzag and more like a fuzzy line centered at y=½. In the real world that’s silly—there is no 1/2th step!—but mathematically there are uses for that concept. It can tell you overall how much energy you expended, or your average elevation over time. It’s not necessarily “real” in the sense that it happened, but in a mathematical sense it’s real in that you can calculate it and it’s useful. A slightly more mathematical way to look at it is to plot it out. What you’ll get is a zigzag pattern. At x=1 you get y=1. At x=2 you get y=0, and at x=3 you get y=1 again. Up, down, up, down. For every odd x you have, y is 1, and for every even x, y is 0. Again, it never equals ½, but then take a step back, squint your eyes, and let the graph defocus a bit. If you look at it from a distance, you lose the zigzag pattern and it’ll look more like a fuzzy flat line filling the vertical space between y=0 and y=1. In other words, like a line centered at y=½. It turns out there are more rigorous mathematical ways of proving this. Leonhard Euler did it, and he was a serious mathematical heavyweight. In a very real sense, that infinite series sums up to ½. If you want, there’s a second Numberphile video with a more detailed mathematical analysis of this part. as they also show in the video. So, you can take an infinite number of positive integers, add them up, and get a negative fraction. Clearly, the Universe has lost its mind. But remember, this only works if you add together an infinite number of terms. As the narrator says, it’s not like you can sit somewhere with a calculator and do it, any more than you can stand on the 1/2th step. It’s a mathematical concept, but it works. I will fully admit this makes my brain cells want to stop instantaneously and explode at the speed of light. But my friend Craig assures me this sort of thing is critical for several fields of physics. In other words, it works. It’s funny: We live our lives, we Earthbound apes, and we think we have it all figured out. Well, we think we at least have a grasp on basic things, even if we know it’s a bit of a madhouse out there. But then you find something like this, something so truly twisted and bizarre that it makes you question just how well you truly see things. We can’t trust our eyes, or our ears, and we have to assume that at least mathematics, the language of the Universe itself, makes sense at some fundamental level. And then you find out that, in a sense, infinity lives a second life as a small negative fraction. It feels more than just weird. It feels pernicious. I couldn’t agree more. Or possibly less. Whichever. Update, Jan. 17, 2014 at 15:30 UTC: I originally wrote that the series 1+2+3+4+5… converges, but that’s not strictly true; it has a sum of -1/12 but by definition doesn’t converge to that. I was loose with my terminology there, so I changed the phrasing.